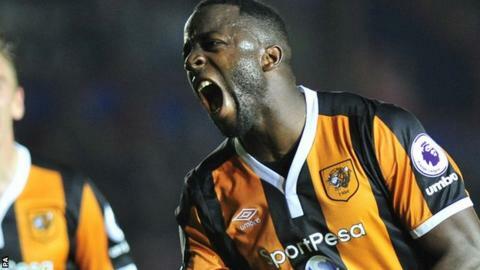 Adama Diomande scored twice as Hull City battled past League Two's Exeter City in the EFL Cup second round. The hosts took the lead with Jake Taylor's stunning long-range strike but Diomande equalised for the Premier League side within two minutes. Joel Grant fired wide for the Grecians before Diomande turned and finished in the area for his second. Substitute Robert Snodgrass' late 25-yard free-kick secured the Tigers' place in round three. Hull had only 13 fit senior players for their opening two Premier League games and made seven changes for this match, with debuts handed to goalkeeper Dusan Kuciak and academy products Jarrod Bowen and Greg Olley. Caretaker boss Mike Phelan has now won all three games this season after being put in charge following Steve Bruce's exit in July. Match ends, Exeter City 1, Hull City 3. Second Half ends, Exeter City 1, Hull City 3. Attempt missed. Harry Maguire (Hull City) header from the right side of the six yard box is close, but misses to the right. Corner, Hull City. Conceded by Christy Pym. Corner, Hull City. Conceded by Troy Brown. Connor Riley-Lowe (Exeter City) wins a free kick in the defensive half. Foul by Greg Olley (Hull City). Attempt missed. David Meyler (Hull City) right footed shot from outside the box is close, but misses to the left. Attempt saved. Joel Grant (Exeter City) left footed shot from outside the box is saved in the bottom left corner. Attempt blocked. Joel Grant (Exeter City) right footed shot from outside the box is blocked. Substitution, Exeter City. Connor Riley-Lowe replaces Craig Woodman. Goal! Exeter City 1, Hull City 3. Robert Snodgrass (Hull City) from a free kick with a left footed shot to the bottom right corner. Substitution, Hull City. Robert Snodgrass replaces Shaun Maloney. Goal! Exeter City 1, Hull City 2. Adama Diomande (Hull City) right footed shot from the centre of the box to the bottom left corner. Assisted by Shaun Maloney. Corner, Exeter City. Conceded by Shaun Maloney. Substitution, Exeter City. Ollie Watkins replaces Ryan Harley. Attempt missed. Jarrod Bowen (Hull City) left footed shot from outside the box is too high. Attempt saved. Tom Huddlestone (Hull City) left footed shot from outside the box is saved in the bottom left corner. Attempt missed. Lloyd James (Exeter City) right footed shot from outside the box is close, but misses to the right from a direct free kick. Substitution, Hull City. Tom Huddlestone replaces Greg Luer because of an injury. Lloyd James (Exeter City) wins a free kick in the defensive half. Attempt saved. Adama Diomande (Hull City) right footed shot from the right side of the box is saved in the centre of the goal. Foul by Greg Luer (Hull City). Troy Brown (Exeter City) wins a free kick on the right wing. Attempt missed. Joel Grant (Exeter City) right footed shot from outside the box is close, but misses to the left.